With a tall task at hand, Babers looks to finish strong while also looking at the future of what he is building at Syracuse. "I think, when you talk about what these 2017 seniors have done, they're going to be the cornerstone and the foundation of what we get done in the future. There's no doubt we're going to win here and be successful. But I think the 2017 class should get a lot of credit for that." Syracuse will say farewell to 14 student-athletes who will either be finishing their eligibility this season as seniors or redshirt-seniors. They include starting wide receivers Steve Ishmael and Ervin Philips (seniors), starting linebackers Zaire Franklin, Jonathan Thomas, and Parris Bennett (seniors), right tackle Jamar McGloster (redshirt-senior), and backup quarterback Zack Mahoney who went from fifth-string preferred walk-on to a scholarshipped player who has started multiple games for an injured Eric Dungey. Looking at these names, it is clear to see that the overwhelming majority of Syracuse's receiving statistics for this season will be leaving a huge gap to fill in the offense, as Ishmael and Philips have combined to account for 175 of the team's 296 receptions through 11 games (59.1%), 1,999 of the team's 3,258 receiving yards through 11 games (61.4%), and nine of the team's 18 receiving touchdowns through 11 games (50%). Zaire Franklin is Syracuse's first three-time team captain dating back to the 1890's. 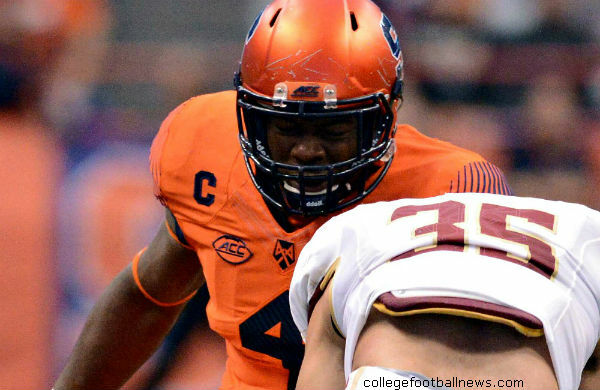 At middle linebacker, as the quarterback of the defense, Franklin has amounted 44, 81, 101, and 77 over his four seasons at Syracuse, from 2014 to 2017, respectively. He has competed in every single one of Syracuse's 12 regular-season games for each of his four seasons with the team. On either end of Franklin, Thomas and Bennett have combined with Franklin to create a trio of hard-hitting and committed linebackers that the Orange will deeply miss as they will have to replace starters at all three positions of weakside, middle, and strongside linebacker. Franklin, Thomas, and Bennett currently reside in three of the top-four spots on the team in total tackles through 11 games, Bennett with 101, Franklin with the aforementioned 77, and Thomas with 49 (Sophomore safety Evan Foster is in third place on the team with 54 total tackles through 11 games). McGloster has been the only consistent body on the Orange offensive line in recent years as injuries have taken their toll along with players finishing their eligibility. Mahoney has played tough when having to back up one of Syracuse's most elite dual-threat quarterbacks in their history, Eric Dungey. He competed with the likes of the LSU Tigers and Clemson Tigers, keeping the Orange within striking distance in games in general, including in games like those versus LSU and Clemson where Syracuse was given no chance from the outside looking in even if Dungey was healthy, A preferred walk-on, fifth-string quarterback got to play against some of the biggest foes in Syracuse regular-season history, and he held his own. From relative obscurity to standing behind center, Mahoney has earned the right to pat himself on the back, whether the wins came or not, for the work he put in that kept Syracuse from simply laying down and rolling over in defeat. "One of the reasons why we want to send them out the right way is I hope, when these young men play their last game on Saturday and they come back in 2018 and 2019 and 2020 when things are different, that the people in the community and the football family gives them the due that they deserve because they've been a big part of this transition, and they're going to be part of the success that we're going to have in the future."